I'm taking advantage of the fact that I'm holed up in a hotel for the next 2 weeks to get some photos out that I've been a bit negligent about. 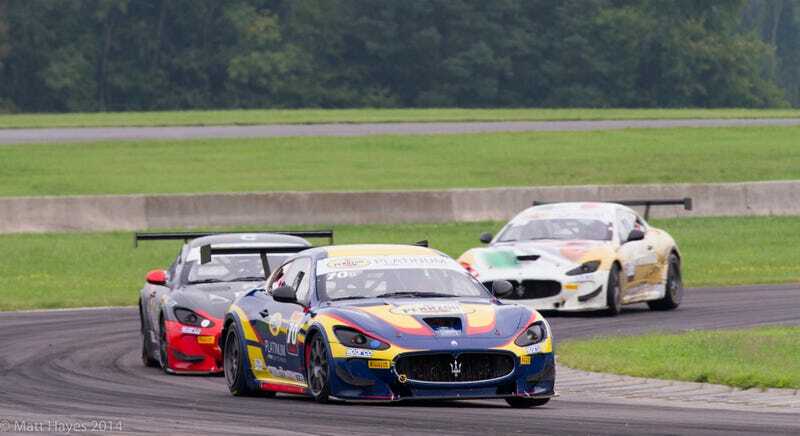 First up is the only round of the Maserati Trofeo Championship to be contested in the US. The sound of these cars was simply amazing. I can equate it to Sprint Cup cars, which I know sounds a bit ridiculous, but the fact that they were always running in packs, and all have V8s led me to draw that comparison. I found these to be some of the more photogenic cars of the weekend too, but, that very well may just have to do with their being the slowest series of the weekend. I've camped at VIR the last two years, and it paid off this year. I've always said there's nothing like being at a race track after hours. This year we were rewarded with the Trofeo garage area being full of activity late into the night. Very cool.